Wimberley Valley Watershed Association is using Salsa Engage Advocacy Tools to Make Their Voices Heard. Wimberley Valley Watershed Association and 5 other water-focused nonprofit organizations in Texas have teamed up to put a ban on dumping treated sewage into the beautiful clear water creeks of the Texas Hill Country. With a team of devoted organizations and Salsa's online advocacy tools, they’re making their voices heard! 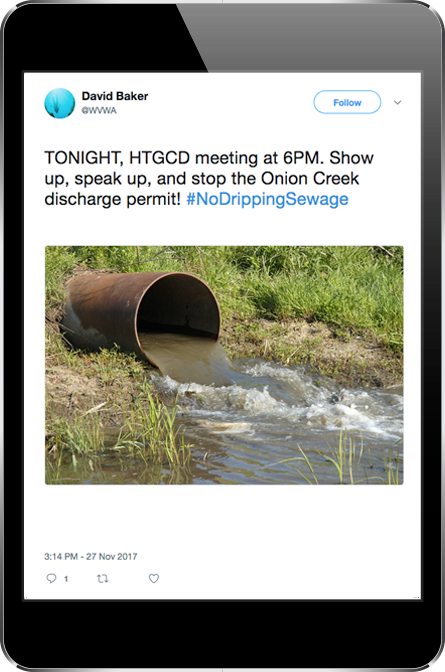 The #NoDrippingSewage campaign launched at full speed in January of 2018 using Salsa Engage online petitions. 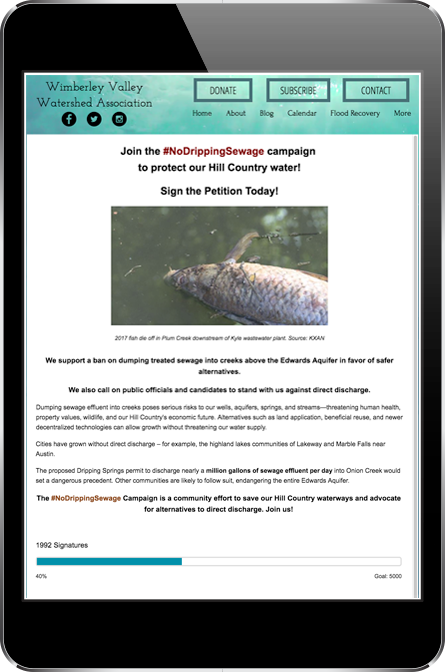 A petition form was embedded onto the campaign page, nodrippingsewage.org, the organization website wimberleywatershed.org, and on another partner organization website. This ability to easily add the widget code to multiple websites expanded the campaign's reach significantly by making it easy for website visitors to find the petition and sign. 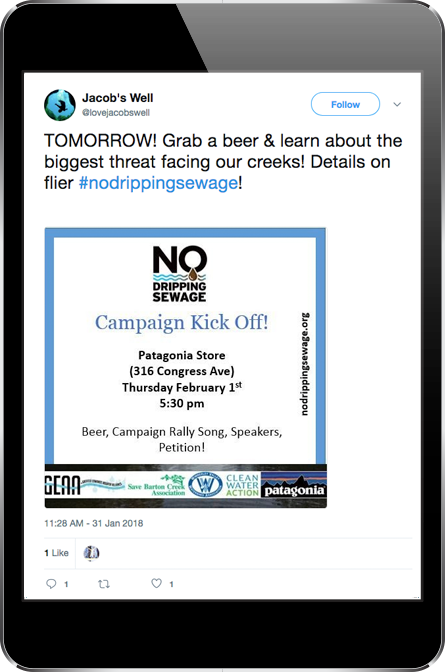 The #NoDrippingSewage team continues to promote and share the #NoDrippingSewage petition on all of their social media channels and send out emails informing their supporters on ways they can help ensure a clean future.  Their action emails sent through Salsa Engage are receiving astonishing open rates of up to 44%. 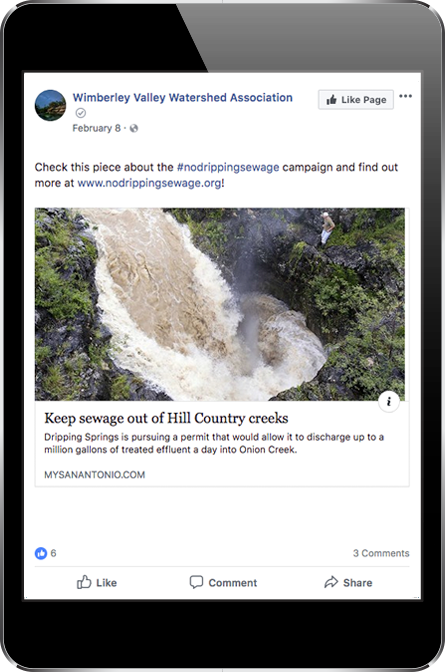 With almost 50% of their 5,000 signature goal reached in just a few months WVWA and the #NoDrippingSewage team continue the fight to prevent millions of gallons of sewage per day from being deposited into the Texas Hill Country creeks. They plan to host more promotional events to spread the word about the campaign and educate the Hill Country’s residents about the threats to human health, property values, wildlife, and the Hill Country’s economic future. As always, they will continue to educate their supporters, subscribers, and the world about the problems associated with sewage discharge and the benefits of more sustainable alternatives.